Heirloom Audio Productions are such a hit at our house that my girls will ask me at least once a month if the next G.A. 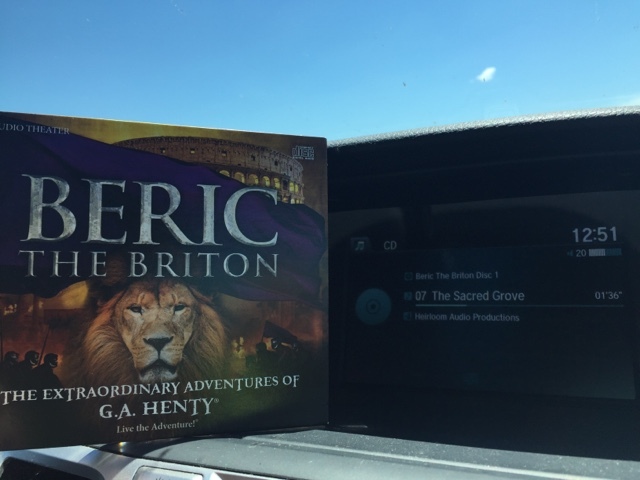 Henty audio drama has been released. Beric The Briton is the newest Extraordinary Adventure of G.A. Henty and it is just as good as the previous titles. We received our copy of Beric the Briton at the perfect time. We were leaving for Indiana in two more days and this would make the time go by more quickly in the car any way. I wouldn't let the girls listen to it at home and it was torture on me to here them beg to listen to it before we left. Beric the Briton Audio Drama is an adaption of G.A. Henty's book by the same name and tells the story of the Roman Invasion. Beric is a Briton chieftain that ruled during the reign of Roman Emperor Nero. Beric brought his men together to fight as a united legion. After the Romans whipped the tribal queen Boadicea the training paid off. They formed a rebellion with other Britons to go against the Romans. Later after Beric is taken captive he is forced into gladiator training but refuses to fight just for the amusement of others. In this story we not only see the battles, gladiators fighting and the burning of Rome but we also see noble people who uphold chivalry by standing up and fighting for the women. When Beric starts hearing about a man named Christus he starts thinking about his beliefs. Heirloom Audio Productions has once again made a wonderful audio drama. The people chosen for the voices are perfect for each part. The background sounds and music envelope you and make you feel like you are part of the story. The excitement while the swords are clashing during the battle and the compassion shown for the women in the story can be felt. Beric the Briton audio is over two hours long and is on two Cds. Along with the audio drama Heirloom Audio has a study guide with discussion and other extras items to get the most out of the story. We received Beric the Briton MP3 set, Beric the Briton e-book, the Official Soundtrack, Beric the Briton Study Guide with Discussion, Printable Cast Poster, Inspiration Verse poster, Live the Adventure e-newsletter, and a Behind the Scenes Video. The colorful Study Guide is beautiful and very easy to use. There are short biographies for G.A. Henty, Nero Claudius Caesar Augustus Germanicus, and Queen Boadicea. There is a study page for each track on the CD and the exact spot on the CD is included at the top of the page to help you find the exact spot on the recording. Each page includes three sections. The Listening Well sections includes questions about the story segment, the Thinking Further section has the listener thinking and drawing conclusions, and Defining Words helps you expand your vocabulary. At the end of the study is Historical Information on Beric the Briton, a list of recommended resources, the Significance of the Colosseum in Christianity, and three bible studies. 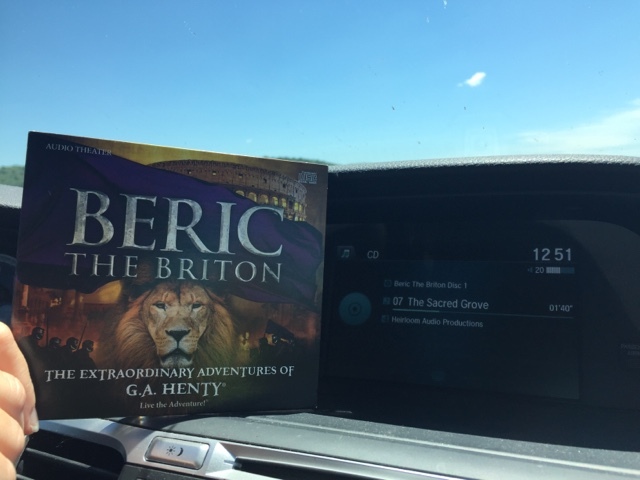 We all listened to Beric the Briton in the car for pure enjoyment and the make the time go by faster on our trip. After we got home we listened to it several more times while we were doing our chores around the house. I decided not to print the study guide, but we used it more for discussion. We read and answered the questions out loud together. I love that the track information for the CD is included at the top. It was very easy to go back and listen to anything we were unsure of. We own every Extraordinary Adventure of G.A. Henty from Heirloom Audio Productions and we will keep adding to our collection as they are produced. Beric the Briton is one of my favorites so far. I really like that it shows how Beric is being told about Christus. It really puts World History and Biblical History together in a way that you can see how they tie together.